The advice from the largest association of franchisors in the Republic of South Africa, the FranchiseAssociation South Africa (the FASA), is that you shouldn’t use an advisor who isn’t a paid subscriber to their association. That advice extends to franchise agreements bought from online retailers. This isn’t impartial advice. The trade association is comprised of experienced and knowledgeable people, but it is a private company, commercially operated to promote and to protect the financial interests of its subscribers. The Franchise Association South Africa promotes ethical franchising. We agree with this, not as a matter of philosophy but because a successful franchisor is one who helps his franchisees to create profitable businesses while he expands his own. 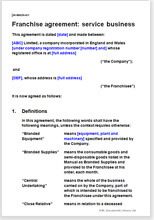 Your franchise agreement has to form the basis of a sound and profitable deal for both sides. The franchise territory can be of any size, from part of a town to a continent. Generally, it is more advantageous to the franchisor to keep the area small and grant licenses to operate in additional areas to the same franchisee later. This agreement can be used to grant territory outside the Republic of South Africa.